Listing with link to your individual page. Includes link to your business website. Listing will be posted to GladePark.com blog. Tip: when it is posted have satisfied customers click on the link to post endorsement comments. Ad will be activated when check is received. Ad will be FREE if you join "The Compensated Marketplace" Ask me about it when you submit your info on the form below! Scroll to bottom for more listings. New listings are posted on Ear to the Ground Glade Park Blog, to let people know you are here. Please let these businesses know that you found them on GladePark.com! 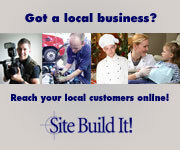 Do you need a website for your local business? glade-park.com became possible when I found Solo Build It! I do not know HTML programming, and had no idea how to build a website. Even if you know HTML, you can start with the knowledge you have, and they fill in the rest. Click on the Solo Build It! link below (CLICK ON BANNER) and learn how you can make it happen: inexpensively, with wonderful tutorials and support. If you decide to sign up, I would greatly appreciate your doing so through a link on this website, as it will help finance this venture! Look it over! Have you been thinking seriously about Sight Build It!, but you need some questions answered first? You are at the right place! GET YOUR SBI! QUESTIONS ANSWERED!